Let us get you out on the water with affordable rental rates. Hobie Pro Angler 17t 70. We have the best selection of boat rentals on the Oregon Coast. We have great setups for groups and families. Mom and dad in a tandem while the kids SUP or kayak. Or maybe dad wants to fish using our Hobie Pro Anglers and everyone else paddles the river. We supply high end gear; paddles and PFD’s. All you need is some sunscreen, a sense of adventure and you will be out on the river in no time. We have a one-hour minimum on all rentals. Our rentals are for the Nestucca river as you launch off our dock. We ask that you stay upstream of the Pacific Avenue Bridge and are free to paddle to the north as far as you can. We carry high-quality SUP’s. The Ocean Kayak Nalu is streamlined, stable, sturdy and easy to keep on track to better enjoy your time on the Nestucca. We have SUP FLOW YOGA classes right out front! More of a traditional surf board shape allows you to move about the board with ease, you supply the grace. 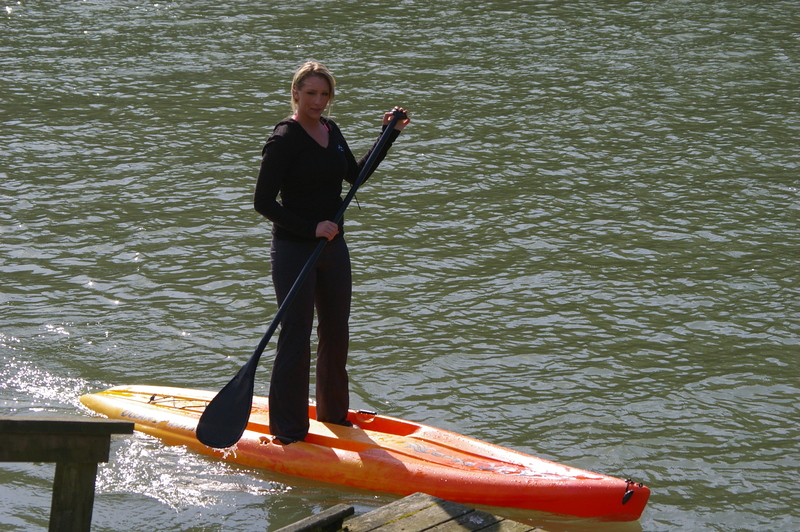 Stand on Liquid and SUPATX boards are ideal for yoga on the water. This is the latest from Hobie and has nearly as many views on YouTube and Social Media as people who watch the Super Bowl. So get off the couch and get on this board. Hobie Mirage Drive will leave other SUP’s in your wake. The ease of the pedal powered Mirage Drive makes Hobie the perfect boat for those looking for an easy paddle on the Nestucca. The on top design and comfortable Vantage seats is what makes these kayaks so popular. We love our Necky and Ocean Kayak boats. The cockpits on the rental fleet are oversized, so it is easy to get in and of out, and there is lots of room for extra gear and lunch. The Necky Manitou II even has a seat for a youngster so everyone can be on the water. Sleek and designed for distance, these kayaks are for the more experienced kayaker looking to cover miles, or just go fast. The Necky Looksha is an awesome setup. All our Hobie kayaks can be fitted with a sail. Off the dock here is usually protected form the strong ocean winds, but a paddle upstream, set sail and take off. The Hobie Adventure Island Tandem we have is a great boat for the ocean. Demos are available to wetsuit wearing adventurers. Safe because of the akas (outriggers) and pretty easy to learn how to sail. We would like to meet you at the shop to arrange a trip around Haystack Rock off Cape Kiawanda.